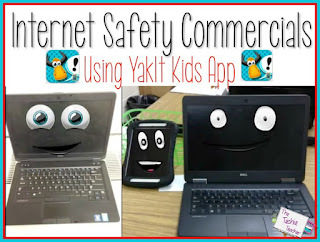 Internet Safety Commercials using YakIt Kids | The Techie Teacher® . The 5th graders at one of my elementary schools took part in a Digital Citizenship Day to complete the Internet Safety modules that all teachers in our county have to complete this year. Each teacher was responsible for teaching one of the modules and students circulated around to each classroom. I was excited to work with the librarian, Theresa Harris, to work with the module that covers internet safety. Theresa purchased 20 iPads for her library this year and she is having a ball learning how to use new apps with her students. She has mastered ChatterPix Kid and was ready to learn something new. Therefore, we decided to complete the commercial students had to create by using the app, YakIt Kids. I think YakIt is a great app to try after you have mastered ChatterPix because it has a few more bells and whistles. You can create multiple scenes and have more than one item come to life and talk. The kids really like how you can change the pitch of your voice to be high, low or normal. I modeled how to use the app with the first two classes and then she was ready to take over and teach the remaining three classes. Way to go, Mrs. Harris! Internet Safety from Julie on Vimeo. Love this idea...but got to step 9 and I'm having a hard time using my mac to duplicate the process. Will keep working on it as I think this is GREAT! But not sure what a server shortcut is and how to drag and drop the link. If you have any suggestions...I'd be excited to learn more. Would you be interested in doing a screencast video of how you created it ? Hey there! The server shortcuts is a server that our school has for students to access links/templates that teachers put into it. If you don't have a server, then the link to your Work Collector could always be posted on your class blog/website, Google Classroom, PortaPortal, etc...whatever you use to get links/documents about to your students :) Maybe we could do a G+ Hangout and walk through the steps on your computer together! Let me know some nights you are free and we can get that going! This idea is amazing! My school doesn't have a server, but is there a way for students to still upload files to their individual folders? Right now students can upload but it all falls in the work collector folder. I believe that providing awareness of child safety for internet will make people able to get best things to make internet safe for their children.